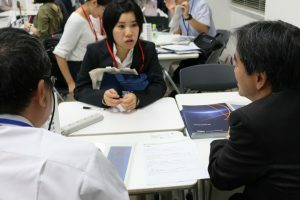 Ochanomizu University regularly hosts the Work in Progress event, which provides a place for doctoral students to interact with private-sector companies and organizations. The event for the 2017 academic year was held on September 27. Six students of the Program for Leading Graduate Schools, who have an interest in working at a private company, participated. of a Corporate Seminar, with representatives from companies, speaking about what they expect from doctoral human resources and about the doctoral-degree personnel that they have hired in the past. 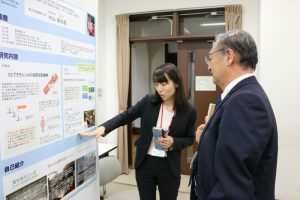 The second part of the event was a Poster Presentation given by the students, and the final part comprised of Individual Exchanges in which students visited the booths of the different companies. It was a lively event, with a continuous st ream of corporate participants coming to visit the students’ poster presentations and actively engaging in conversations with the students. In the previous academic year, this type of event helped connect students and companies, even led to internships and employment. Thus, this event has become important for the students of our program to encounter the business world. Accenture Japan Ltd., Aspark Co., Ltd., Data4C’s K.K., IBM Japan, Ltd., National Institute of Advanced Industrial Science and Technology, NEC Central Research Laboratories, Novartis Pharma K.K., PwC Consulting LLC, Ricoh Company, Ltd., Shiseido Company, Limited, Weathernews Inc., The Yokohama Rubber Co., Ltd.